The easy, non-invasive measurement procedure make the AGE Reader an ideal tool for health assessment in various settings. Offering AGE reader measurements additionally as part of medical check-ups for patients, private persons, pharmacies and companies helps to enhance a healthy lifestyle. Therefore it improves the health situation of patients. What do we measure with the AGE Reader? The AGE Reader measures glycated proteins in tissue: AGEs (Advanced Glycation Endproducts). AGEs play a central role in the development of cardiovascular disease and diabetes (and its complications). AGEs accumulate over a person’s lifetime, but this process occurs more rapidly in patients with conditions such as diabetes mellitus, renal failure and cardiovascular disease. In addition AGEs play an active role in the development of vascular complications. 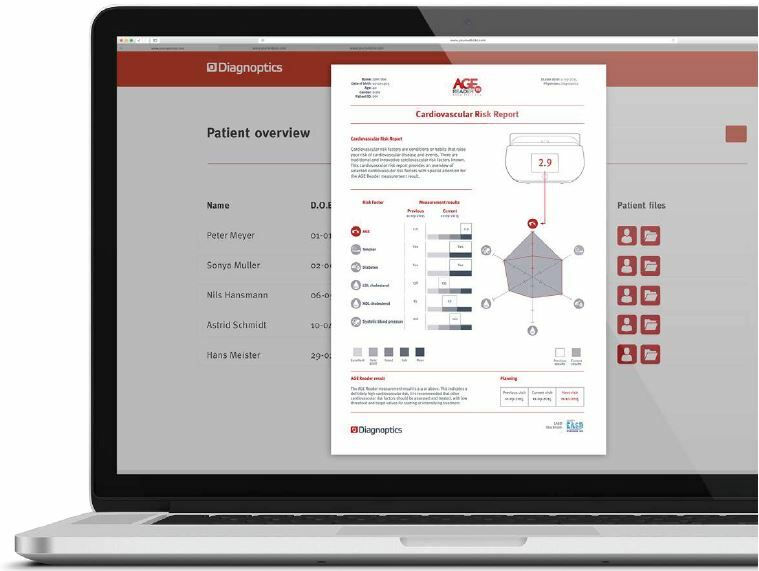 The AGE Reader measurement result consists of an easy to interpret cardiovascular risk report. The measurement result is compared with the reference values of healthy subjects. A colour coded graph displays this information. The green and yellow areas indicate there is no increased risk. If the measurement result is in the orange or red area this indicates there is an enhanced accumulation of AGEs in tissue. This results in an increased risk of having or developing cardiovascular disease or diabetes. Measurement results of the AGE Reader in the green and yellow area indicated a normal result for healthy individuals. It could therefore be interesting for them to learn more about AGEs and obtain advice on lifestyle measures they could take to manage their levels of AGEs. 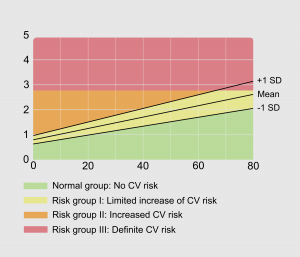 If the AGE Reader measurement result is in the orange or red area for a non-diagnosed person it is recommended to consequently check other risk factors for cardiovascular disease and diabetes. Additionally, these test can consist of measuring blood pressure as well as a number of blood tests such as a lipid profile + HbA1c or glucose. If during these test it is found that more risk markers are present it is recommended to perform additional tests focused on specific medical conditions. Therefore with this professional preventive concept and screening method, cardiovascular screenings and diagnostics becomes easier to fulfil and understand.